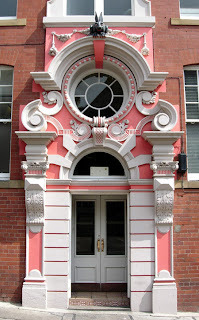 This sweet little blood-sucking bunny sits above an ornate doorway in the British town of Newcastle Upon Tyne, waiting to spring on unsuspecting pedestrians. I've done a little research, and apparently no one knows who put it there--or why. Does it really spring on innocent pedestrians? Or just sit and watch them? I've held a bunny in my lap before. It was white and it kept hopping so I got some scratches :( But it was exactly like a cat! So cuddly, it was as big as a cat too! Weird, weird, weird! But kind of cute. Irregular Kiki: I've read The Truth Cookie, but not the others. It was funny. Btw, Irregular Kiki, you're getting pet chickens!? OoO That's AWESOME!!! That door looks like it belongs on a shop at Disney World. I wonder who put the rabbit there and why? Seems like a weird thing to do. Really cool! More like an evil Disney. I've been there, and nothing like that would be able to get anywhere near there. Maybe the people that built it met my friend's rabbit. Her rabbit growled at me! It's that evil. also it attacked my sister's hand when she tried to pet it! the curse of the were-rabbit got into somebody's head? anyone hear about this outrage? I'm so mad, she won the race and didn't get first place because she wasn't in the elite group... completely idiotic!!! I have had 2 pet rabbits. They are great! I think that who ever desinged the doorway put it there, it goes with the rest of the house. that's kind of freaky.does anyone know the oldest you can be for juvinile prison? it's for a story i'm writing...and it's really important. Anonymous: Usually 18, but in some parts of the country people as old as 25 can be put into Juvenile Hall. Check out the Wikipedia Entry. Maybe its set there by its vampire masters? i dunno. thats kinda stupid. Lady Dahlia: Congrats on your blog and your book! I'm not sure what's going on with your publish button. What does it say when you click on "Edit Posts" on the Dashboard page? thanks. i've got about 8 pages of my story written so far....but that's typed up. and i have a whole lot of other pages from the story to type up. i originally wrote it on binder paper. Kiki Strike ITSC: the edit posts page said my post was scheduled for 12:10am. Obviously it's been posted already. Thanks for the tip! No idea why it did that with my first post. My second post showed up on my blog right away. Oh well. I like it. 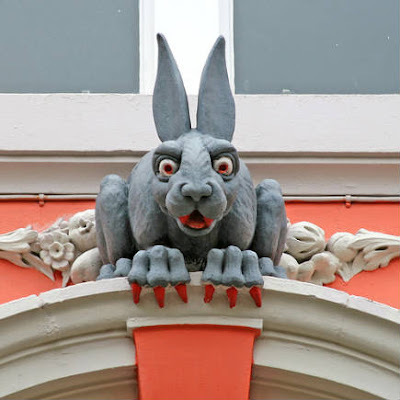 The bunny's like a modern version of a gargoyle. And gargoyles are THE most amazing architectural detail in the history of architecture. Except, perhaps, for arches. Those are pretty handy. I'm just wondering, but have you read the Twilight series? What do you think of it? it's a door to an office of lawyers. I live in Newcastle but I've never been there. I'm Back, and So Is the Creepy Gnome! Due to the Overwhelming Number of Entries . . .
Big Thanks to New City Library!